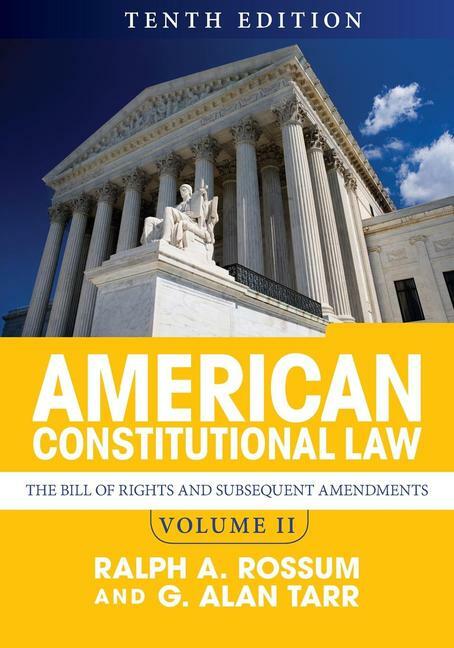 American Constitutional Law, Volume II provides a comprehensive account of the nation's defining document, examining how its provisions were originally understood by those who drafted and ratified it, and how they have since been interpreted by the Supreme Court, Congress, the President, lower federal courts, and state judiciaries. Clear and accessible chapter introductions and a careful balance between classic and recent cases provide students with a sense of how the law has been understood and construed over the years. The Tenth Edition has been fully revised to include twelve new cases, including key decisions Obergefell v. Hodges, Burwell v. Hobby Lobby Stores, Shelby County v. Holder, Horne v. Department of Agriculture, and Riley v. California. A revamped and expanded companion website offers access to even more additional cases, an archive of primary documents, and links to online resources, making this text essential for any constitutional law course.